ITS FINALLY SNOWING! Fingers crossed for a snow day tomorrow, even though Im supposed to be doing the late night shift at work so who knows. Today my laziness got the better of me and I decided to skip college to stay in my cosy warm bedroom. I did however get dressed (after about a hour or two of watching daytime tv!) and snap some outfit photos for today. I was sent this dress by ClubCouture, A brand that I'd never heard of, The "Club" part sort of scared me as I was expecting like hideous neon raver clothes, But no, I was pleasantly surprised, looking through their webstore I decided to accept their offer of a few items to try out. The dress I wore on this weeks Sunday Portrait was one of theirs, It actually reminded me of something Carrie would wear. Anyway I picked this dress because I loved the pattern, and I knew the shape would flatter my figure, but of course I didnt take the weather in the UK into consideration. Then thinking back a few months ago I wore this outfit, which was basically just a plain jumper thrown over a summery skirt. I didnt even realise at first but Im wearing a similar necklace too! So much love for this American Apparel pullover, I've wore it to death! I was also thinking about wearing my much loved paneled body con over it and having the dress tucked in so it was like a vest, then layering up with a big cardigan! Im feeling pretty inspired by the dress to be fair! I will not let winter stop me from wearing the clothes I want to wear! I've scheduled tomorrows monthly favourite post, So fingers crossed it will post before I get home! I've not finished it yet either so it might not be the usual 100 outfits! You look soo lovely!!! Great dress! Your outfit posts are great. I really like how you piece items together and make it look so effortless! Love your outfit, especially the sweater!! So cute. i love how easy to navigate their website is! good stuff. i love that jumper! Apparently they're calling this thin layer of grey slush snow here in London. Yeah right. cute video, i love your hair and voice! eheheheeh now i sound like a stalker. i wore a dark blue oversized jumper with a black bodycon skirt recently, same sorta idea! nice change from tucking everything in all the time! <3 this outfit Lily its really nice... i've also got that coloured nail varnish <3 it! the necklace is so cute! cute outfit! I've got that nail polish, too, and I love the colour! May have to take advantage of that discount as I really liked you Sunday Portrait dress. Your hair's been looking super beautiful lately! cute as ever. i have that nail varnish on right now too. TWINZIES! Your hair's got super long, freakin' loves it xo. I really like how you're not afraid to tuck a dress in, or put something over it. Next time I go thrift shopping that when I look as dresses, I will try to think if they would work as a top, and skirt. Thanks for the inspiration! i really love your hair!!! i'm jealous! That is such a cute outfit! I love it! That dress is a must for my wish list! Aw i nearly bought this pullover/jumper about 50 times in the lighter grey. i never could bring myself to pay £28 for it, i still really want it though. One day i will own this jumper. you've got the most amazing sense of style ever! that sweater is really cute, and looks proper snug, i need one like this! 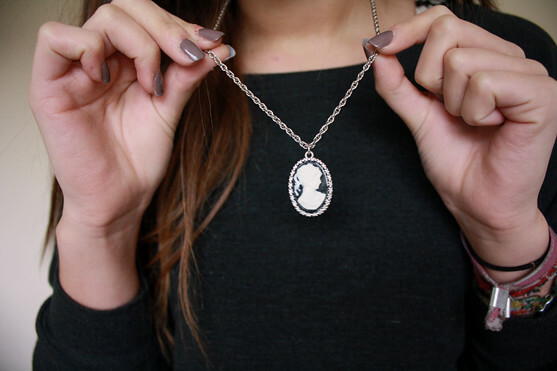 I really like that cameo necklace - have been looking around for one as a gift and this one just about fits the bill! Also, your nails always look so shiny! Do you use a specific top coat? Hi, just found your blog through another lovely blog, and I am amazed by your talent for writing, fashion and photography, not to mention you're simply stunning! I am an aspiring journalist, and I get so excited when I find blogs such as yours as they provide inspiration and motivation. I am definitely becoming a follower . i think i really need some of this mushroom nail polish, it's a lovely colour! I cant get over how much I love this outfit. I think the necklace is my favorite! I'm new to blogging and I would love any sort of feedback or constructive criticism. Thank you! can you visit my blog and leave a comment please?